Welcome Heroes, to the first Season of the Overwatch Campus Clash! Gather up your fellow students and participate in our Winter Stage to gain crucial points, as well as opportunities to pick up Blizzard goodies! The available map pool is: All Maps. Best-of-Five (Bo5)-Teams alternate banning maps until 5 maps remain, these maps are then played in a random order. Best-of-Three (Bo3)-Teams alternate banning maps until 3 maps remain, these maps are then played in a random order. Best-of-One (Bo1)-Teams alternate banning maps until 1 map remains, this is then the map played. Map ties will be settled by a Bo1 Control map announced before that night’s games begin. The tournament consists of six (6) weeks of Swiss with one (1) week of four (4) best of ones (BO1) after which five (5) weeks of two (2) best of three (BO3). The top 8 will then qualify into playoffs with the remaining teams continuing the Swiss for final finish seed as well Swiss prizing. 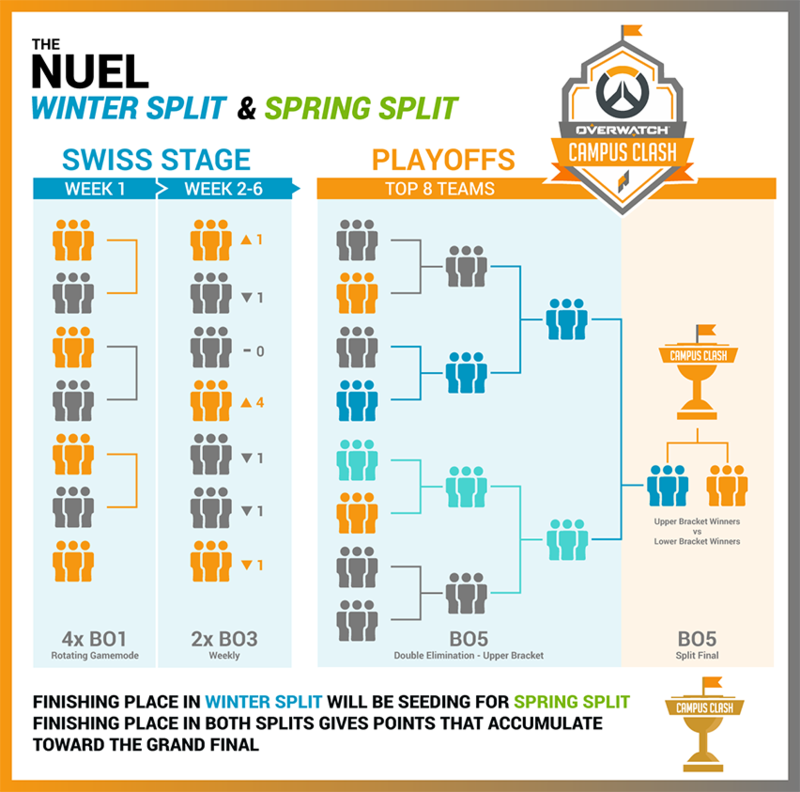 Playoffs for the top eight (8) will be Double Elimination for three (3) weeks with eliminated teams returning to the Swiss tournament to play for final finish. All the teams who make it into play-offs get Championship Points for the Grand Final in spring. After the end of the Winter and Spring Stage there will be a Grand finals for the best performing teams. Finalists from Spring will automatically qualify and the remaining six (6) will be based on a total of Circuit Points.